The HBO miniseries "Empire Falls" was actually Skowhegan and Waterville, and some other surrounding communities of Maine. Because Paul Newman died I went to photograph the now famous Empire Grill. 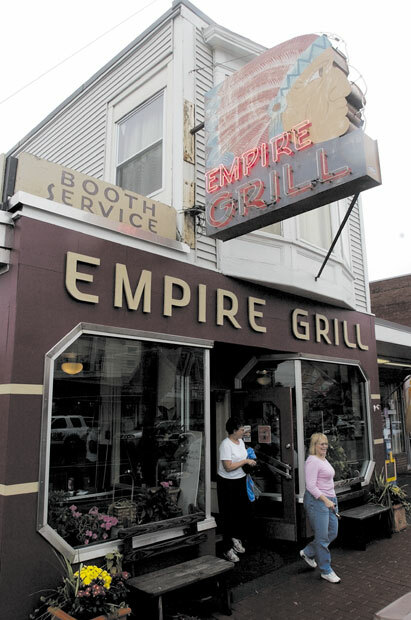 Betty Anne Hofmann and Diane Engler, both of Skowhegan, exit the Empire Grill which was made famous by the filming of the HBO miniseries "Empire Falls." Hofmann's son Greg worked in wardrobe for the movie. "In fact, I had Helen Hunt's sneakers for a while. They didn't fit her," said Hofmann. "I wore them out."